An alarming tendency of a deterioration of the human rights situation is observed in Ukraine. Events of the last year and legislative initiatives submitted to the Verkhovna Rada during the last session show it. 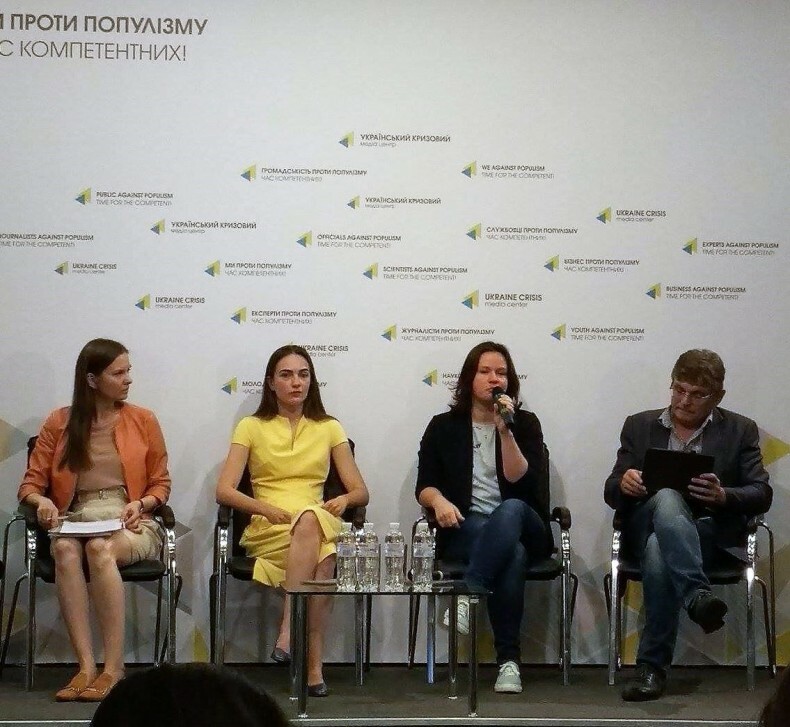 Human rights defenders at the Center for Civil Liberties, Amnesty International, the Ukrainian Helsinki Human Rights Union and the Open Dialog Foundation announced this during a press briefing at the Ukrainian Crisis Media Center. This is about voting to change the procedure of electing the Ombudsman to an open one, which creates great risks. This norm was included in the law on the Constitutional Court of Ukraine, to which the institution of the Ombudsman has nothing to do, reminded Oleksandra Matviichuk, chairman of the Center for Civil Liberties. Arkadiy Buschenko, Executive Director of UHHRU, drew attention to Bill No. 6688 “On Ensuring Information Security”, which introduces the concept of “technological terrorism” with a misleading definition that poses a threat to the biased application of the law. Human rights defenders also drew attention to cases of approval of the most important state decisions without consulting with the public, in particular, the draft law on the de-occupation of Donbas, the use of paramilitaries by the Ministry of the Interior for the maintenance of public order; separate violations of the freedom of peaceful gatherings, excesses in the work of law-enforcers; campaigns to discredit activists who counteract corruption among government officials and reformers who have tried to break the system; proposals for new, excessively strict reporting requirements for civil society organizations. The latter, in particular, provide for reporting even for individual entrepreneurs that provide services to civil society organizations, and exclusion from the register of nonprofit organizations for breach of reporting deadlines. “We believe that these bills are aimed at complicating, and in some cases, the impossibility of the work of organizations… This is very similar to Russian approaches to non-governmental organizations, many of which are recognized as “foreign agents”. We have not yet come to this, but the proposed bills are a step towards this,” said Arkadiy Buschenko. “It is clear that during the war, even unannounced, human rights, which are not absolute, may be limited, but proportionate. All these restrictions should lead to a goal that is publicly announced when this goal cannot be achieved in other ways. And the fact that we are witnessing in various spheres of government decision-making testifies about a disproportionate restriction of rights. Given the link to the struggle with the Russain Federation, at least part of society supports these disproportionate restrictions. There is a paradoxical situation: if this trend is not stopped, Ukrainian citizens will voluntarily give the rights and freedoms for which they fought and shed their blood during EuroMaidan. Our task as a country implementing democratic reforms is to win the war, but not turn it into authoritarian Russia,” emphasized Oleksandra Matviichuk. Oksana Pokalchuk, Executive Director of Amnesty International in Ukraine, drew attention to the growing influence of the church in the state, despite the fact that the Constitution separated the church from the authorities. “What we see now is a very aggressive, active and unpunished attack on all religious denominations on decisions taken by the Verkhovna Rada,” she said. Under the influence of the Council of the Churches, ratification of the Istanbul Convention is blocked, which is part of the European integration obligations of Ukraine. Recently, they have submitted a bill proposing to open the Parliament session, praying “The Lord’s Prayer”. There is also a bill on the prohibition of abortion. Although since March it is not mentioned in the media, it is still registered on the website of the Verkhovna Rada. “We copy the practices of totalitarian countries – Turkey, Russia … It is offensive to our rights”, emphasized Oksana Pokalchuk. Liudmyla Kozlovska, president of the Open Dialog Foundation, noted that Western partners noticed these tendencies and this could have consequences for the image and support of Ukraine. “Such things no one will tolerate, and the first “bell” has already sounded in PACE. We were also invited to present our report during sessions of the UN and the European Parliament. Our task is to support people who are struggling for change in Ukraine clearly. And this is a very clear signal for today’s authorities,” she emphasized.